This week, we are hearing from Emily, one of our Aquarists who works with sharks! 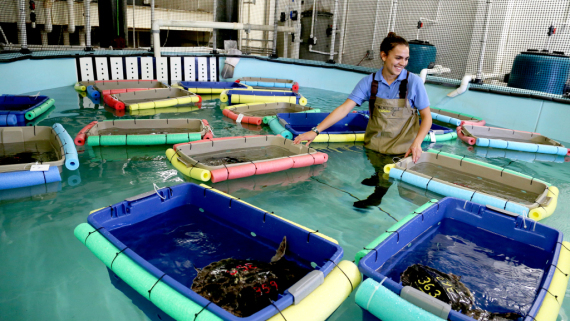 You may be wondering what sharks have to do with sea turtles. Read on to find out. At the North Carolina Aquarium at Fort Fisher, I have the opportunity to do many different jobs relating to the maintenance of our exhibits and care for the aquatic life living in them. 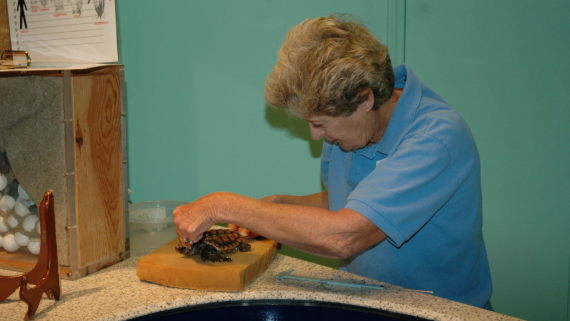 My job entails preparing food and feeding animals such as freshwater turtles, various amphibians, snakes, alligators, stingrays, sharks and the loggerhead sea turtles. 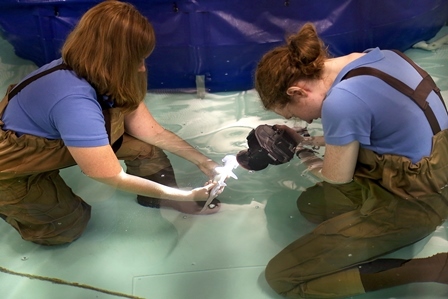 I also assist in cleaning exhibits these animals live in and testing the water chemistry of each system. Shark populations are declining all over the world. 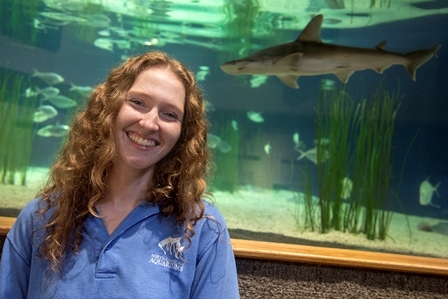 The North Carolina Aquariums are working to understand these and other species in order to conserve different populations. As a joint effort with the University of North Carolina at Wilmington, I am researching juvenile bonnethead sharks at the Aquarium. 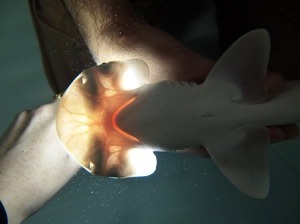 Studying sharks living in human care is important to better understand their biology and behavior in the wild. Bonnetheads are a highly migratory species, which means they travel great distances during their lives. Their migration pattern makes studying wild individuals difficult, so learning about these animals is key in learning about the species. Many shark species are top predators and vitally important in the ecosystem. Together, sharks have the ability to eat many different animals from shrimp to seals. 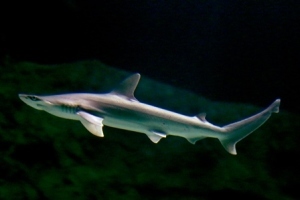 As top predators, sharks help to keep the population of their prey in check, and therefore the populations of their prey’s prey. This is why sharks are considered a keystone species, or an animal that keeps food webs in balance. 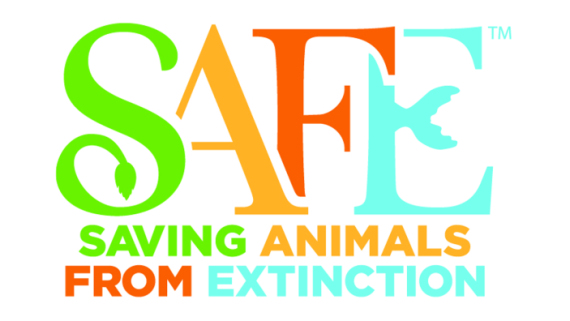 Without sharks, other species would dominate the food web and animals lower in the food chain can grow out of control. The presence of sharks in areas with rich animal diversity, such as coral reefs, signifies a healthy, well-balanced ecosystem. Areas all over the world are seeing a reduction in shark populations, which is another sign of the decline in other fish species. 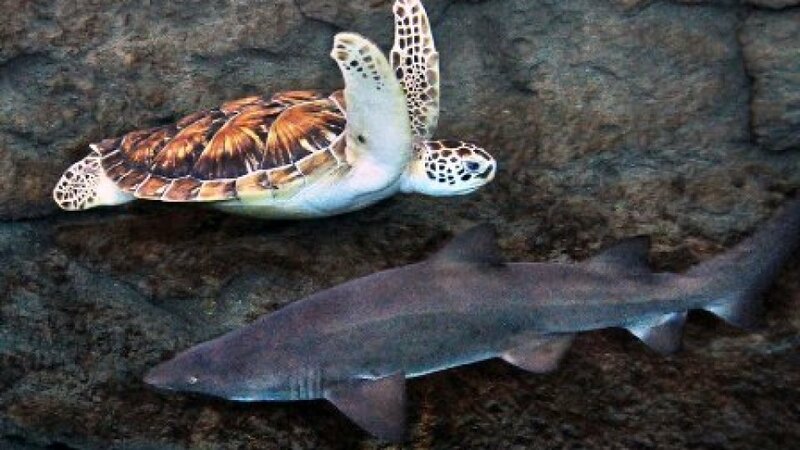 Sea turtles and sharks are interconnected in many ways as well. 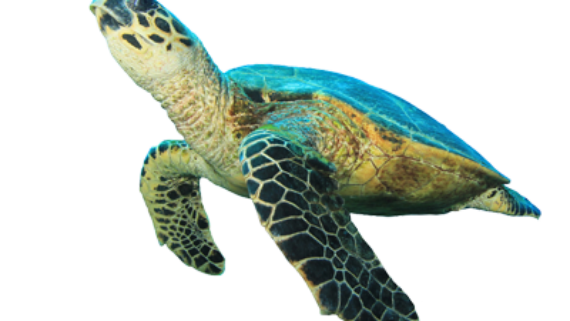 Sea turtles serve as prey for different shark species, and are also affected by changes in other animal prey and the changing climate. When healthy ecosystems can support sharks, they are also likely to support sea turtle species. 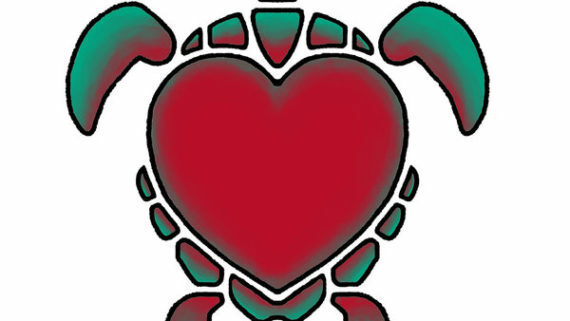 It is important to learn more about wild sea turtles as well as wild sharks in order to help preserve the ecosystems they live in and maintain the delicate balance of the ocean. 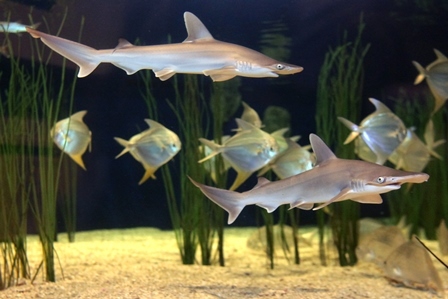 You can see both sharks and sea turtles on exhibit at our Aquarium when you visit. Turtle A is now 11.6 cm long and weighs 289 grams and Turtle B is 10.7 cm long and weighs 252 grams. Not sure what to do with this weight and length? 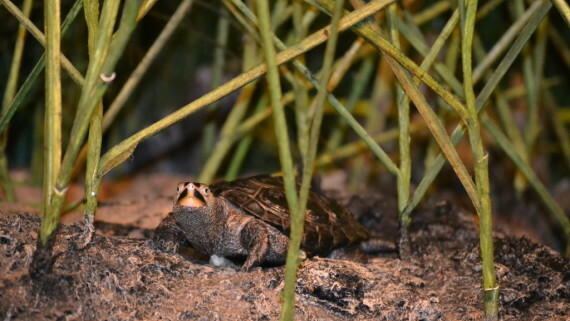 Learn more in our Hatchling to Yearling lesson plan. Next week we will be taking a break from blogging for Thanksgiving, so make sure to check back in with us in two weeks.